Update: Contest is now closed. Congratulations to Chris Larys! 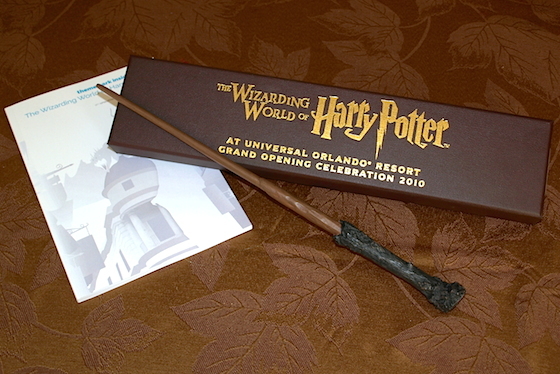 Today's giveaway is a commemorative wand from the 2010 opening celebration of The Wizarding World of Harry Potter, plus a signed copy of our guidebook, Theme Park Insider Visits The Wizarding World of Harry Potter. You must be a registered member of the website, with a valid email address and uploaded profile photo, and logged into your account, to enter to win. "If you had a horcrux, what would it be?" Daniel Radcliffe did an AMA (Ask Me Anything) Q&A session on Reddit this week, and someone asked Radcliffe that question. (He congratulated the Redditor for asking a Harry Potter-related question that Radcliffe never had been asked before!) I loved that question, too, so I decided to ask that of you, here. I will pick the winner by selecting one eligible entry at random at the deadline. (I will contact the winner via your email address in your registration profile. If the winner does not respond to me within 48 hours, I will disqualify that winner and pick another one, until I get someone who does respond.) Once we have a winner, I will post that to this page. The deadline for this giveaway? Let's make it Sunday at 3pm PT. Good luck! We've got two more giveaways to go! Tomorrow, we will be giving away a Dooney & Bourke Mickey Mouse handbag. We hope that everyone is having a fun time playing along with us, and that many of you are getting to know the new version of our website. If a Horcrux is supposed to be something meaningful that would hold part of my soul, my Horcrux would be my copy of my favorite book of all time, Ender's Game by Orson Scott Card! Awesome story; changed my life! I received a ceramic ghost statue from my grandmother and I think I'd use that. The tap at The Leaky Cauldron that dispences Butterbeer. A Theme Park Insider t-shirt! I've got a jade necklace I bought in New Zealand of a mythological creature named Manaia - part bird, part man, sometimes part other things - that symbolizes protection. That'd be mine. I have a Christmas/Halloween ornament of Maleficent. She's my favorite Disney villain, so I'd use that. It would have to be a Lego Minifigure, an astromech droid. My Horcrux would be my keychain dongle. My horcrux would be snow globe my daughter made me. My Horcrux would be my LEGO Harry Potter minifigure ... but I have like 20 of them, so you'd have to know which one! Luckily it is impossible to destroy a LEGO so I am safe!! Mine would be my favorite pillow! And Bruce reads my mind! I was sure that was what you were thinking. The oil painting portrait of my daughters when they were 1-year-olds. My Horcrux would be my toy monorail from Magic Kingdom that I got over 15 years ago. This was a tough question for me to answer, but I would have to say the Elephant Juju I got at the Adventure Trading Company back in August. Even though I got it recently, it's still a special souvenir for me. Hmmm... my Swiss Army Mickey Mouse watch. I think it would be the urn that holds my late wife's ashes. Mine would be my late fathers senior ring. My horcrux would be my glass eye. No one would suspect it. The Triwizard cup of course! Great question. My Horcrux would be my Star Wars Blue Snaggletooth Action Figure. I've had it since I was a kid. My horcrux would be my Thestral. Mine would be my Wizarding World of Harry Potter chocolate frog pin. Nothing better than chocolate! Mine would be the horrid Mickey Fantasia Hat at the MGM/Disney Studios where they don't film anything anymore. Evil be gone! For obvious reasons... My horcrux would be my "Ashes of Problem Students" jar that sits on my desk at school. My horcrux would be my 1969 Mickey Mantle baseball card. No one would ever destroy that. My horcrux would be my Alfred Hitchcock poster. My horcrux will be the model that I eventually build showcasing my dream of a two-sided Möbius strip rollercoaster. The contest is now closed and I have emailed the winner. Thank you for entering!